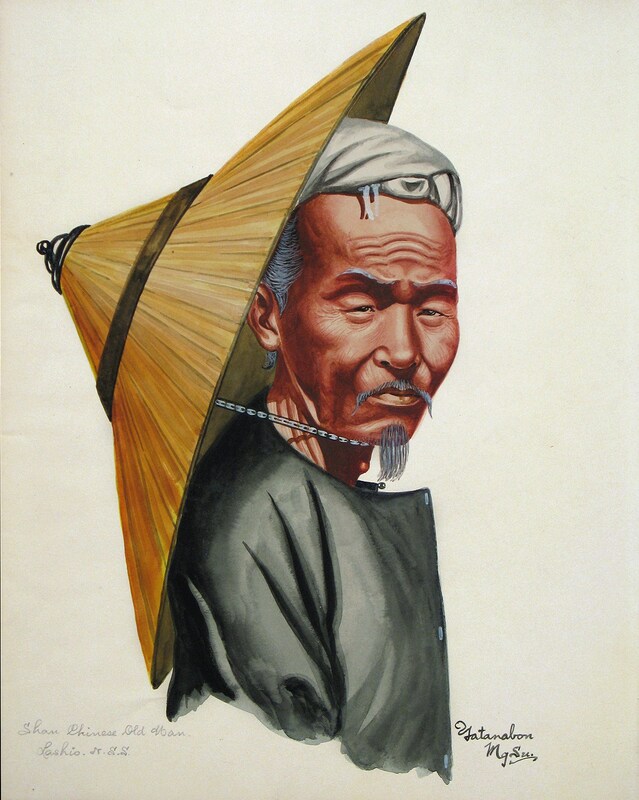 This watercolour signed ‘Yatanabon Mg. Su’ in the bottom left hand corner and with the description in the left corner of ‘Shan Chinese Old Man, Lashio, NSS’ shows an elderly Shan man from the torso up. He wears a dark jacket, a white headscarf, and a large cane hat. The rendering of the man’s face particularly shows the artist’s great skill: it is both an ethnic study with traditional attire and a careful portrait of a man as he peers towards the viewer with a furrowed face. Nine paintings in a similar vein as this example are displayed in the collection of the National Museum of Myanmar. Five more similar paintings are held by the Victoria & Albert Museum in London. Works by the artist are reproduced in Khin Muang Nuynt et al (2006) and Ranard (2009). Almost all Yatanabon’s known works are of ethnic portraits. They are characterised by careful observation and stern elegance. Relatively little is known about Yatanabon despite his representation in public collections although interviews with a descendant in Ranard (2009) suggest that Yatanabon was born in Mandalay in 1903 and moved to Rangoon in the early 1920s. He was a composer, singer and musician as well as being a painter. He concentrated on painting after 1930. He is known to have painted duplicate paintings of the same subjects although with small differences. A very similar example of this painting is illustrated in Ranard (2009, p. 68) for example. Possibly he also worked from early photographs. Working from photographs is not unusual and is a practice that continues today with modern Burmese painters. The condition of this watercolour is fine. Khin Muang Nuynt et al, Myanmar Painting: From Worship to Self-Imaging, EvoHeritage, 2006. Ranard, A., Burmese Painting: A Linear and Lateral History, Silkworm Books, 2009.